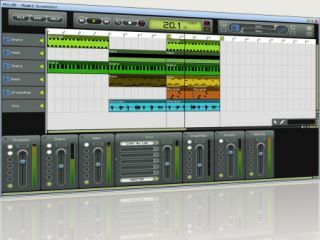 MUTOOLS' MU.LAB Free gives you six tracks to record on. MusicRadar is on a quest to keep track of all the latest developments on Planet Freeware, serving up a weekly report that lets you know what's new and what's been updated. In this, our second seven-day wrap-up, we bring you a multitrack spectral analyser, the latest version of a cross-platform recording package, a multi-effects unit and a MIDI scripter. And you won't have to pay a bean for any of them. Now compatible with FXpansion's VST-RTAS Adapter and featuring improved window handling in the AU version, this is a 31-band spectral analyser that's designed to be used in a multitrack environment. In other words, it offers spectral analysis of several audio signals simultaneously. Just updated to version 2.5.4, this is a simple recording app that should make it easy to record your music. Featuring MIDI and audio support, it can also run VST plug-ins and act as a ReWire Master. Hell, you can even boot it from a USB memory stick if you want. This tweak adds an Event Monitor plug-in and fixes various bugs. All versions of this multi-effects plug-in (including the Pro edition) are now available as freeware. It's designed specifically for live/real-time audio work and, to this end, has various 'triggering' options. Specifically, you can make FX selections and adjust mix values from your MIDI keyboard or other control surface. Another horse from the AZ Audio stable, this MIDI processing tool is available in both plug-in and standalone versions. Described as 'a relay between the host and the instrument', it's not exactly pick-up-and-play software, but power MIDI users should swing by the AZ website and give it the once over.